Here’s the latest rub in the accounting marketplace: you’re competing with a computer – and it might be smarter than you are. Say, “Hello” to Watson, IBM’s artificial intelligence platform. While you may not have had time during tax season to check out H&R Block’s commercials, the partnership between big computing, enterprise cloud services, and a mega-accounting firm, could mean big trouble for your CPA practice. If you haven’t heard of AI, this is just the beginning of this exciting technology. Artificial intelligence is cognitive computing technology or “thinking” computers. What this means is that AI platforms like IBM Watson, are programmed with complex algorithms that allow it to take in information, and then adjust its response based on that data. The big move by IBM was to begin offering Watson’s intellectual horsepower as an enterprise cloud service. For consumers, this meant error-free accounting that maximizes refunds. The IBM website aptly points out that there are 74,000 pages of tax code out there and many ways to complete the process – but only one will reap the maximum refund. Request a quote on managed IT services for the small accounting firm. Its machine-learning algorithm eats terabytes of data for breakfast. human can do. For Watson, all that tax data is a walk in the park. What the customer experienced last tax season was a tax advisor seated between two computer monitors. One monitor allowed the consumer his or her own screen to follow along and answer Watson’s questions. The other monitor was Watson itself, responding in real time to the client. This personalized experience coupled with an engaging computer interface, made for something entirely different in the conservative world of accounting this year. How Can the Small Firm Compete with a Machine? PriceWaterhouseCoopers released a white paper this year on tax analytics and AI. It’s a fascinating read, suggesting that enterprise cloud services offering AI will begin to take over the mid-level accounting functions at most firms. In fact, PwC has spent big bucks incorporating AI into their processes. Experts agree this isn’t a fad, but a foretelling of things to come in the accounting industry. 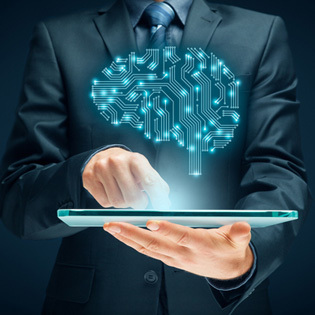 It is expected that most commercial software tax preparation packages will begin to incorporate machine learning (AI) into their version upgrades. In the meantime, small to mid-sized CPA firms will continue to do business with existing clients based upon their prior relationships as trusted advisors. But these firms should also look toward enterprise cloud services for ways to improve the customer experience – or risk falling behind in our increasingly digitized society. Get a free assessment of how cloud computing could help your business model.